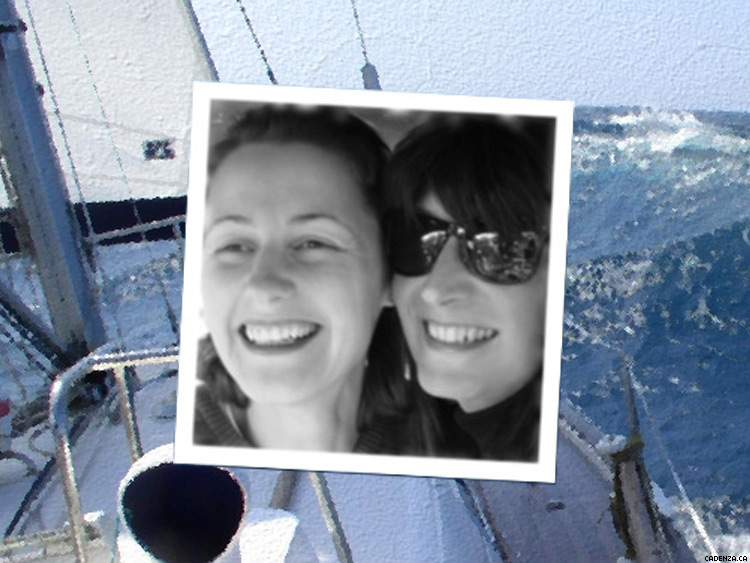 Elena and Meg spent 10 months on the ocean in otder to be together, a story Elena shares in a new book. Russia wasn’t an easy place to be LGBT even before the infamous 2013 “gay propaganda” law and the recent persecution of gay and bisexual men in the Russian republic of Chechnya — as demonstrated by the inspiring story of two women who escaped by boat. The story of Elena, a Russian, and her Canadian partner, Meg, appeared this week in Prospekt Magazine, an online English-language publication based in St. Petersburg, Russia, and Elena has also written a book about their experiences. While dating a male colleague and hiding her attraction to women, Elena began chatting online with Meg. “Meg soon became her most trusted confidant and her role model,” the magazine reports. “Meg can do everything, she is a musician, she plays the piano, flies planes, sails boats. … To me she was this incredible woman, she simply stunned me with what she could do, and, of course, I pretty much instantly fell in love with her,” Elena explained. After six months of online communication, they made plans to meet in Kiev, Ukraine, early in 2006. Elena told her parents she was going away for a weekend, but she had plans to leave Russia for good, which surprised even Meg. After a few days with Meg, Elena started receiving calls from her family and her boyfriend. Elena told them of her relationship with Meg, and they demanded that she end it and return to Ivanovo. Finally they came to a compromise: Elena would meet her mother at the train station in Kiev to say goodbye, then go off with Meg. But her father unexpectedly showed up too, and he and her mother gave Elena an ultimatum: She must come home with them. A fight ensued, and police took Elena, her parents, and Meg to a nearby police station. The police took the side of the two young women, and Elena’s mother and father finally agreed to go back to Russia without her — but after they left, Elena discovered that her passport was missing. That meant she would likely have to return to Ivanovo. Meg, however, began planning an escape. A colleague of Elena’s managed to get her passport back and brought it to her in the seaport city of Odessa, Ukraine. Elena and Meg then went to Turkey, where Meg bought an ocean-worthy boat with proceeds from mortgaging her house in Canada. They spent the two months in Turkey allowed by their visa with Elena taking sailing lessons and Meg outfitting the boat. Then they began a grueling 10-month journey. “The North Pacific was the toughest part of our trip,” Elena told Prospekt. “Before that, I had never seen nature being that dismal and threatening. In the open ocean, hundreds of miles off the coast of North America, we found ourselves in the worst sea conditions that we had ever experienced. Many times we thought we wouldn’t make it, and once we had to run south for good, but eventually we got to the longitude where the wind wasn’t northwest anymore and then again headed to Vancouver Island — for Canada.” They arrived in the middle of the night in April 2007. Now they live on the boat full-time. Meg sold her home in Victoria, Canada, and works as a computer programmer, which she can do from the boat with an internet connection. Elena told their story in a Russian-language book, hoping to inspire others. Life is good, she said. Elena’s book is in the process of being translated into English under the title Talking to the Moon. Chapters will be posted online as they are ready; find them and and more information here.